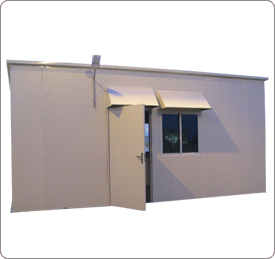 Sandwich panels are highly desirable for Modular Rooms and Utility Cabins. The avoidance of Brick and Mortar enables quick installation but the main advantage being re installation to a different site. These Modular rooms come with Windows as desired by the customer, doors, canopy and all necessary flashings to ensure good rigidity.